Basketball Staronline slots casino game is not just for basketball or sports buffs. It’s a fun game with superb graphics. Set not surprisingly in a basketball court to the sound of the crowd cheering, you feel as if you are at a live game. This is a great way to experience basketball whether you are a fan of the game or not. One of the original slots developers, Microgaming is based on the Isle of Man. Since 1994, they have grown in stature and have over 800 different slots which are played across the world and of a very high graphical standard. In 2010, they launched an integration platform called Quickfire Games which enables other game developers to offer their games through Flash and Mobile platforms. If you like Basketball Star you’ll probably also like Microgaming’s Football Star or Centre Court. 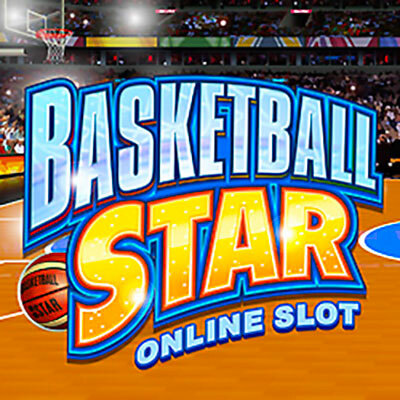 Basketball Star online slots has a 5 reel, 3row, 243payline format. There are no usual playing cards in this game. Every symbol is connected to basketball. The lowest paying symbol is the basketball court tactics board, then there’s the drinks tray, basketball shoes, medallion. Five symbols featuring basketball players head up the higher end of the paytable, with the basketball star the highest paying symbol. Click to read the game rules and Pays to view the paytable. ClickBet to select what to bet (from 0.50 to 50.00). You can choose the coins (1 to 10) and coin size (0.01 to 0.10) to bet with. You can click Max Bet if you want to go with 10 coins and 0.10 coin size (50.00). You can play auto by clicking Autoplay and choosing a number of spins. You can stop it at any time by clicking Stop Autoplay. Triggered by three or more scatters, you’ll earn 15 free spins for three, 20 free spins for four and 25 free spins for five. You can earn more free spins if scatters pop up again. Each time you win, the winning symbols are replaced and the replacement symbols may trigger another win. Be aware that scatter symbol wins only turn into rolling reels during free spins. Reels 2, 3 or 4 will turn completely wild at random, guaranteeing a win when they do.